Welcome to the Australian Suzuki Katana Owners Group! Having grown so rapidly over the years, (we've had to update some information) with our memberships well into the hundreds and still increasing, we are gaining more recognition from around the world as a worthy and reliable forum you can count on. Continuing our work to keep this forum open to people like yourself around the world. Keeping our information reliable and updated is one of our many tasks. Keeping our members well informed is our priority too. Being here, you have taken your first step to discover more about this classic motorcycle with its own unique history that sets it apart from others. 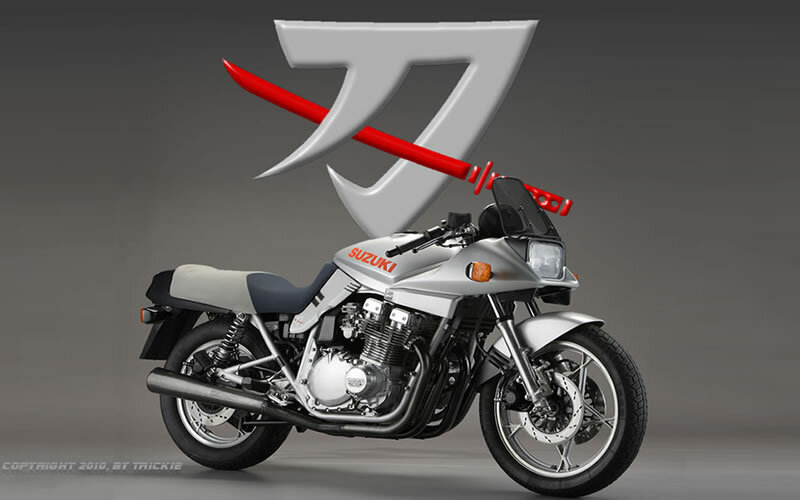 When the Katana first appeared in the 1980's it was revered as an advanced aerodynamically designed production motorcycle for its time. This came about when Suzuki approached Hans Muth to design something new and different, they were about to embark into an era of motorcycling that will forever change the motorcycling industry.This site allows for many to find and meet up with fellow Katana fans (we also have contents on other bikes as many of our members will have more than one bike). To date we are quite the popular forum. As these classic bikes age they become more of our history, as so many people can recall them from their first appearance into the market. The early eightie's saw the introduction of both the GSZ1000, GSX750, GSX1100 bike both for the privated sector and in the motorcycle racing. Strangers to the Katana fall in love with its unique style and as many of us, we fall in love with its bond with our early lives. There is and will always be a place in peoples hearts for these wonderful classics. This forum allows for you and friends to come and join in on friendly stories, helpful hands with issues, get together for a drink or BBQ. They are not just a bike, they bring people together. The forum itself whilst open and free to all, though we still need to keep out the ugly spammers thus registration required, provides information and friends from afar and next door. We have sections for State and Territories, including our friends from overseas somewhere they can talk, ride, or gather together for a friendly ride. Other areas of the forums have been set aside for subscribers and members for a more private chat so as to keep their private information out of the public areas. Events are posted strategically so members do not miss out. And we have a D.I.Y. section for those with sound knowledge of bikes to be able to find information to assist them with repairing thier bikes. And you may also find the clssifieds section enjoyable where you can post something for sale or in the wanted section if you require a part or bike. Welcome to Mick Hone Motorcycles, your first choice for Suzuki Motorcycles and Scooters in Melbourne. We carry a huge range of new and used Suzuki motorcycles & scooters in store and our comprehensive workshop is ready for any servicing, repairs or upgrades you may need.Our friendly staff are here to advise on the latest Suzuki models help you with an questions you may have. Drop in and see us today at our Mont Albert store and be sure to check out our website for any OEM parts or accessories for your machine. Suzuki GSXR Australia - this forum is an Australian Based Motorcycle Community dedicated to the Suzuki GSX-R.
Everyone is welcomed, even if your worldwide member to owning a non GSXR motorcycle to not even owning a motorcycle. With a combined total of over 120 years experience in manufacturing coats and a wide range of all-weather products, we understand that everyone has individual needs when making a purchase that they know will last for many years. Our entire manufacturing process is done within our own factory located in Brisbane Australia using the highest quality resources available, so we are able to custom make to suit your requirements. Our skilled team is committed to producing garments of excellent workmanship. The Bear Ride is on again this year. It was such a success last year that we have kept the same format (you raised over $15,000). It is now confirmed the 35th Katana anniversary will be held at Albury. Get your Kats up and ready. There will be prizes to be won but most important is to meet up with other members from other states and countries...to meet new friends. We will have a few overseas Katana guest coming to meet us. They'll never find the Sale at "night" riding a Pop-up. So is that 25% off total sight in the dark? Would that be only 50% remaining if/when they pop up? ….thank heavens for midnight tonight! At that price you'll get intercepted for GST and attempted import duties (which you can get past if you quote the correct import category). Foot rest with bracket, rear blinker. Thanks Pat, found 2 on ebay for $55. On there way.